Would not recommend this product, used it only once. Plugged it in and the screen started malfunctioning and I️ started to smell a burning smell and the product had a small amount of smoke come out of it. Got scared so I haven't used it since. 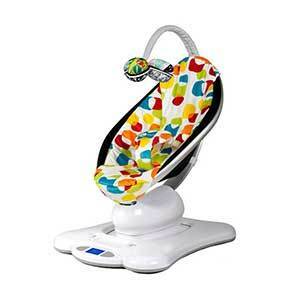 There are other better baby rockers/ swing that are cheaper and better quality. This chair has been so helpful in soothing my baby when I need a little break. It was handy for her as a newborn because we have two stories and didnt want to move her all the way upstairs and risk her waking up if she fell asleep while nursing. I've as able to easily move her from the couch to the Momaroo and turn it on without disturbing her. It's an okay product. The mobile doesn't move on it's own so you constantly need to spin in for baby to be entertained. It's a little loud. Overall baby likes the movements but doesn't stay in it for more than 10 or 15 minutes. As a newborn my baby loved it here and there. Mainly loved the sound machine part the most so much for the first month i had to play it while sleeping. But draw back if your child is super spoilled and likes to be in mommy or daddy arms it just does not do the trick like it was supposed to. Considering how much i payed for it i expected my baby to love this swing be in it as much as possible but that was not the case. Not saying its not worth it i seen some babys in it almost round the clock and work wonders its just depends on the child. I got this from my sister who used it with her daughter. I was first like i don't need these. Ooooo I was wrong! You need this. Ok mama do you need this. It worked like a charm!! My son was very colicky and this helped him so much. You can adjust the seat so they don't lay so flat and raise up a little so it helps with reflux too. You can add your phone and play your own music too. Big fan of this and i highly recommend it. Love that the seat is washable. Must have for new moms. Worth every penny. I love this swing I've had 3 different ones. I went through tons of batteries and motors going out with other brands so i decided i would try a more high end swing and I'm so glad i did. This swing always put my sweet babies to sleep. my daughter was in it till she was 9 months old.I love that the swing has bluetooth and i can control it from my phone. I also like that i can hook my iPod up to it and play my own music on it. 4moms has great costumer service so if you have any issues with it in the 1st years and you have your receipt they will take care of you.I would never use another swing. When we had our son and were deciding on a swing, we settled for the mamaroo. It has a sleek, futuristic appearance and it is advertised to "move like you do". It's rocking motion is meant to mimic the swaying of laying a caregiver's arms. 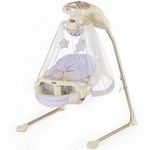 We also expected that because it was so pricey compared to other swings on the market, it would be a phenomenal baby item. Needless to say we were all disappointed. While my son does use it for naps, the attached mobile does not do much to hold his attention. The variety of motions is nice, but it's not really necessary. We tend to only use one of the options, as it is what the baby seems to prefer. 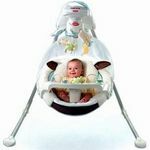 The base of the product is sturdy, but the part that circulates to move the seat is quite wobbly, especially if baby is fidgety. The built in sound machine is awful. The speakers are crackly and full of static, causing the sound to be quite abrasive, instead of the intended soothing. We have not used the MP3 player attachment as the speakers are not of good quality. Overall, this product seems to be something of a big hype. So many of the features that seem like a good idea, either we're not implemented correctly during manufacturing or they are not necessary. This product has been a total lifesaver. 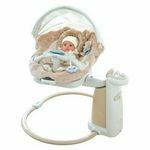 It easily rocks our baby to sleep and also helps her stay asleep if she falls asleep in our arms and we need to set her down. 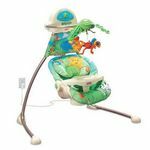 It's very safe and sturdy and the different motions are great. The sound quality isn't really the best, but it is fine for what it is. I do wish the mobile would spin on it's own.